Writing about an ethical dilemma requires a clear understanding of the situation. Writing clearly about the complexities of morality requires strong communication and critical thinking skills. It can be challenging yet fun to examine different sides of a conflict and explain it thoroughly so that readers formulate their own opinions. 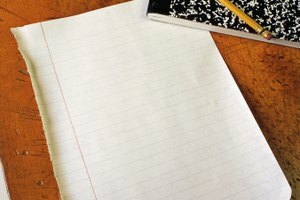 The techniques for a well-crafted paper can apply to an essay for either your law, philosophy or religion class. Write an introductory paragraph or two that broadly covers the topic. Pose questions that your essay will attempt to answer related to ethics. Cite examples or famous quotes by individuals who have previously explored the ethical dilemma. Write a second section that outlines the facts of the situation that is posing an ethical dilemma. Be as descriptive as possible as to the individuals involved or the details of the particular situation to be analyzed. Write your third section outlining an optional compromise course of action based on the situation or theory described. Tell why this course of action could be considered morally wrong and by whom. Cite factual examples of people or theories that support such a course of action. State in your fourth section the opposing viewpoint in contrast to the previous viewpoint examined. Be specific as to why there is a disagreement. Again, cite factual examples from experts that support your opposing issue. Write your conclusion rephrasing your introduction and stating that there is not a simple answer. Provide directions as to what the readers should consider in attempting to solve the ethical problem you presented. You can also conclude with your personal choice and your moral beliefs that led to your decision. Have someone else read your paper and provide feedback as to clarity. Ingram, Kai. "How to Write About an Ethical Dilemma." Synonym, https://classroom.synonym.com/how-to-write-about-an-ethical-dilemma-12082283.html. 29 September 2017.